How to Stockpile Food  Talk about not even giving the basics! This article is endemic of "everything's OK and I don't even need to do the bare minimum"! Somewhere between these minimalists and the extremists on the History Channel's Doomsday Preppers (who've got it wrong in many areas and makes preparing look crazy), is where you need to be. It was a near-given that this program would paint preppers as wackadoodles and in this regard, it doesn't disappoint. To be fair, some creative and unique ideas are demonstrated, but then they gum up the works with the ridiculous. 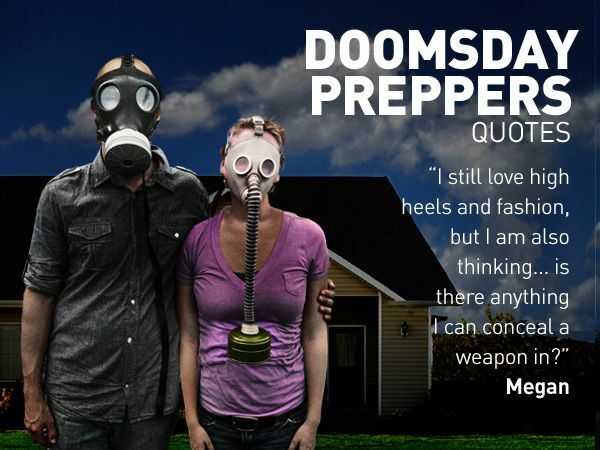 Doomsday Preppers could have been a really good wake-up teaching tool. However their "expert" analysts who rate the preppers' efforts at the end of each segment are exceptionally narrow-visioned. They often overlook important considerations like medicines, fuel, heating, extra clothing, alt. energy, and pet items to name a few in favor of reading from ludicrous scripts. Their experts neglect the whole picture and in nearly every segment they conclude that the prepper's concerns were mostly invalid and score them accordingly. So what is the point of the show? The only value we see in this program is to share what preps could be made. Forget their extremist sensationalism like wearing gas masks in America for Japan's Fukishima Daiichi meltdown, or keeping $350,000 in stored foods. We have yet to witness a single person here parading around in a gas mask over the last year. These lengths are meant to look ridiculous and be self-defeating. Was this the program's main purpose? Who is financially capable of spending a half million bucks on dehydrated food? Not many, and the Lord doesn't expect us to, but He does expect us to do what we can and rely on Him for the rest. By showing people going to such extremes and saying this is the way to prepare, it squashes the heart and desire of those who don't have the financial means or space to do so. SHAME ON THEM! It spurs people to give up before even trying, and the little bit of effort they might have expended, which could save their lives, is crushed before even begun. Don't buy into National Geographic's self-defeating nonsense. Instead, go to our 100% FREE prep website and make use of the info. It costs you nothing and you can prepare a little bit at a time. But get busy  time's a-wastin' and it may save your life.